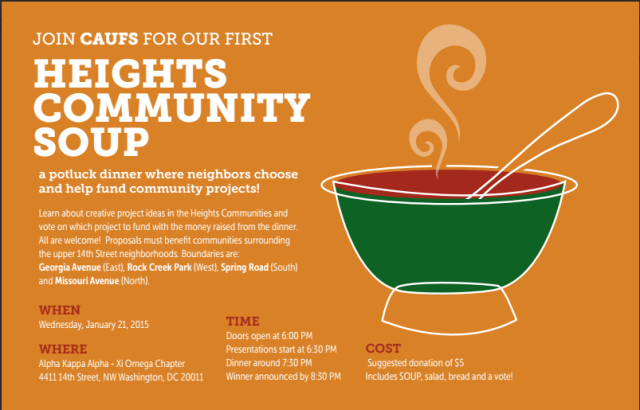 “Reminder to please join us at the first Heights Community Soup tomorrow, Wednesday, 1/21. What is it? A community dinner where neighbors gather, and for a $5 donation share dinner including soup and bread (made and donated by owner of El Chucho, Jackie’s and the upcoming Little Coco’s) and creative ideas for the neighborhood, and vote to fund one of four proposals presented that night with the dinner’s door proceeds. 4411 14th St in the AKA Sorority building. This is modeled after Detroit Soup, through which residents have gathered and voted to micro-fund many creative projects across the city.